Today, it just started to snow here in upstate New York and it's the perfect introduction to a great offer. Each friday from now until Christmas, I'll be announcing a Flash Sale. It could be just one particular item, a category or items or a discount coupon code. But, one thing is for sure, the offer will be the deepest, steal of a deal, discount that can possibly be offered. After having such a great 2012, I wanted to give thanks to fans and customers with an offer to scoop up that beautiful Crystal Allure Beaded Jewelry piece they have had their eye on -whether for themselves or as a gift. 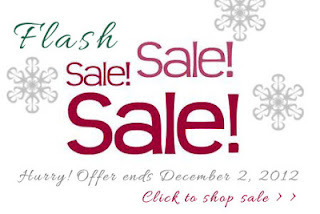 But, hurry, this first flash sale is only for 3 days and ends midnight December 2, 2012. 2. Have that hard to get for family member -specifically your Sister? No matter how turbulent sister relationships can be at times, the one-of-a-kind Swarovski Pearl Yellow Daisy Sister Heart Charm Necklace N101 will surely show your sister how much you care. 3. How about a little sparkle for yourself? For that upcoming holiday party or holiday gathering, the Swarovski Crystal Ice Endless Shimmer Necklace N103 is well...brilliant! 4. The summer loving gal will love the Seascapes Blue Lampwork Shell Charm Sterling Necklace N056. At less than $30 on this flash sale, it's as good as a steal! 5. You know, every year you wait til the last minute to get your February born wife (or, girlfriend) a gift. Well, now you don't have to wait for that perfect sale to come along. It's already here! And us February ladies do indeed love our amethyst! She will surely fall in love with the Amethyst Gemstone Circle Necklace N051. 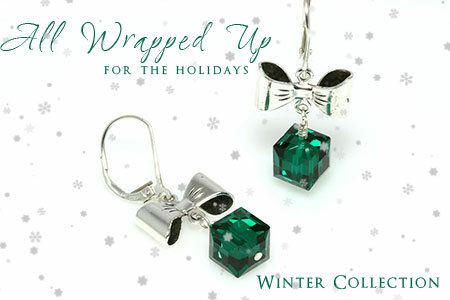 Why not go the extra mile for that birthday gift and add a little more love with the matching earrings! 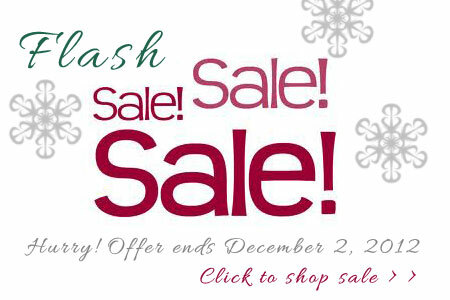 Shop the Flash Sale from 11/30/12 - 12/2/12. How are we near closing out November already?! What happened to January through October? Wow! Has time flown by. Although, I am a sucker for the holidays. I love the snow, cold wintery nights snuggled up with a soft blanket and yes, I even (sometimes!) love to do some holiday shopping. We've all survived Thanksgiving (and I hope everyone had a great one!) and even Black Friday. But, today, we celebrate online shops with spectacular Cyber Monday sales, specials and discount offers. Today, at Crystal Allure Beaded Jewelry, you can save 40% off your entire online purchase! Discount offer ends midnight EST and applies to all in stock handmade beaded jewelry and beaded gifts. It does not apply to sale items, past, present or future custom orders or requests. This special Cyber Monday offer is not one that is offered often (now that is a tongue twister!) and with our beautiful jewelry and gifts being mostly one of a kind -it's an offer you won't want to miss out on. Simply enter the coupon code: cybermonday40 at checkout to receive 40% off your entire online purchase. I have to admit, I never really got Twilight. I can remember seeing tidbits of it all over the web and I would think, 'what is this Twilight', or 'what is all the hype about this Twilight'. But, for whatever reason it just didn't grab me (enough, I guess) and I had no interest in learning anything about it. Until. One day, I realized that as my second oldest neice got, well, older, I was losing pace with keeping connected with her. And I missed that..immensly. So, on purely that reason alone, I finally broke down and asked her what Twilight was all about. She went into a hyper-excited explanation and interpretation about the storyline....from day.one. (ugh). But soon, I was all caught up on the vampire series and as I learned, just in time for Breaking Dawn Part 1. She was more than happy (can we say, excited!!!) to bring the tapes of the first two series' over for a sleep over. Even as I watched the first two series', I just didn't get it. But, I forged on. For the sake of staying connected with her. Even to this day, with Breaking Dawn Part 2, only 16 days away from release, I'm still not a huge Twilight die-hard. But, that didn't stop me from being inspired by it! I've seen many interpretations of Twilight into handmade jewelry, but most are literal or of the style or quality that I just don't subscribe to. In designing the Crystal Allure Beaded Jewelry's one-of-a-kind Twilight Inspired Necklace, I wanted to take a more classic, refined approach. I wanted my inspired piece to be something that could be worn anytime, any day, for any reason. Most of all, I wanted it to have timelessness. I didn't want it to become obsolete after all the fan fare died down about Twilight. What emerged from the studio is a timeless handmade beaded necklace that projects an air of intrique, mystery, passion and love. Designed with rich blood red velvet faceted lentil beads, dark hematite Swarovski Crystals, sterling silver Bali beads and finished with our sterling silver signature jewelry tag. 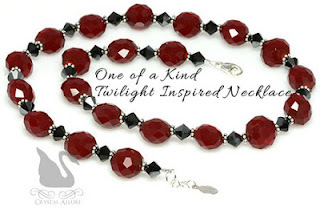 To add to its' uniqueness, the Twilight Inspired Red Velvet Crystal Beaded Necklace (N037) is a one-of-a-kind!